I always thought that a brussel sprout was just a baby cabbage. But no. Although both are of the brassica oleracea species, they are a different cultivar. 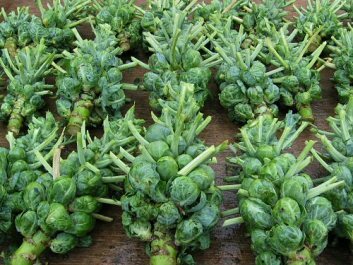 Brussel sprouts grow like this, in happy, close-knit groups. This makes me like them even more than I already did, because it's so cute. Parmesan Walnut Broccoli, which ended up being the basis for my own brussel sprout mission. I intended to make the broccoli version, but most of the broc was looking yellow and sad. The brussel sprouts made a perfect stand in. Cut the brussel sprouts (and broccoli, if you are using it) into small enough pieces that they will pan-sear. I ended up with halves for the small sprouts and quarters for the large ones. Assemble the veges in a bowl and add some crushed garlic or chopped shallots and a sprinkle of salt. You can also add nuts - walnuts, almonds or pecans would all work well. Add to your ingredients a mix that is approximately 25:75 white balsamic vinegar to olive oil. Start conservatively with the vinegar - you can add more during cooking. Use enough vinegar and olive oil so that after stirring through, the ingredients are all lightly covered, but not slimy. If you are on a sugar-free diet, use apple cider vinegar. This still tastes great, but won't caramelise. Pan sear everything in a hot, oiled pan until the veges are tender. If they start to get brown and crispy, take the pan off the heat for a few minutes and turn down the heat. I used a cast iron pan. It's practically a two-man job to get it on the stove-top, but the 'ridge effect' result is worth it. Crunchy cheesy version: sprinkle parmesan cheese over it all near the end of cooking and keep moving it around the pan so that the cheese browns slightly but does not burn. This makes a fantastic stand-alone or side dish. The nutritional high points are (per half cup): 46mg folate (~11% RDI), 48mg vit C, heaps of vitamin K (well over the RDI), and decent amounts of the carotenoids lutein and zeaxanthin, which are good for your eyes. I added some poached white fish for a light lunch. Lunch was smallish because I had plans to work on a new chocolate creation, which requires extensive, calorie-laden quality control steps. I am trying to make a nut butter centred chocolate that is sugar free. My first attempt, using erythritol was (quote / unquote) "edible", but only to me, because I can eat anything with cacao in it. I'm a person that actually likes 99% chocolate and that's what this tasted like. It does look pretty though and the texture was great. The basics are: cocoa butter, coconut oil, raw cacao powder (say 2 tbsp for every 6 tbsp of fat), vanilla, salt and sweetener. It's getting the sweetener right that's eluding me right now. Xylitol would be better, but many people can't tolerate it. If you have any tips on making amazing sugar-free chocolate, please speak up in the comments. From many experiments that ended up feeding mice in compost heap, I know that stevia does not work well with chocolate. I look at it, and imagine all it could be, and will be. Destiny shall not be denied.